I have this image in my head of the perfect wild mushroom, as the one in the children’s books… the beautiful and perfectly formed one, with a slim white trunk and lovely red hat with white dots… Not a lot of people know that the kingdom of wild mushrooms is mind-blowingly big and very diverse. The above mentioned example is however one of the non-comestible and poisonous ones, even if used very often to picture the forest fungi. Good to know that the forest is full also with lots of hidden edible delicacies! In the late summer and throughout the whole autumn, a few days after a rain shower, the ground starts to be sprinkled with wild treasures coming out in shapes as unusual as funnels, balls, trumpets or sponges! 1. The delicious boletus edulis (known also as cepes or porcini) are often so well camouflaged with their brown colors that they are difficult to spot on the forest ground for a non-trained eye. They differ in size from small to really big. It’s funny how its name in different languages gives you information about its appearance or taste. The German name ‘steinpilz’ (stone mushroom) refers to its firm flesh. While the Italian ‘porcino’ could be interpreted that either pigs were known to love them or their shape is similar to piglets. They are loved by other forest animals too, as the Dutch name ‘eekhoorntjesbrood’ (meaning ‘squirrel’s bread) suggests. Whatever the previous descriptions might refer to, you dont know what expects you until you have the chance to order and taste the famous and one-in-a-million risotto: risotto porcini! Best is of course when prepared with fresh cepes, if available. The flesh simply melts in the mouth, while the perfume transforms the rice into a very delicious dish. Best prepared only with salt and pepper, avoiding strong addition such as garlic or parsley or other flavors in order to preserve the boletus original aroma. 2. Some centuries ago chanterelles were named, not by accident, “one of the most important and best edible mushrooms” by the the Swedish mycologist Elias Fries. This was back in 1836! The golden variety has a very high content of vitamin C and vitamin D, while the flavors of the different sorts of chanterelles can range from fruity to a woody, earthy fragrance. Chanterelles are never eaten raw, because they develop more flavor when cooked. 3. The black trumpet mushroom, known mostly as ‘horn of plenty’ or even ‘trumpet of the dead’ (as its name is literally in Italian and French) is a fine delicacy with a lot of flavor. It grows mainly under beech or oak trees, especially in moss and moist spots. It can be found from mid-summer to November. 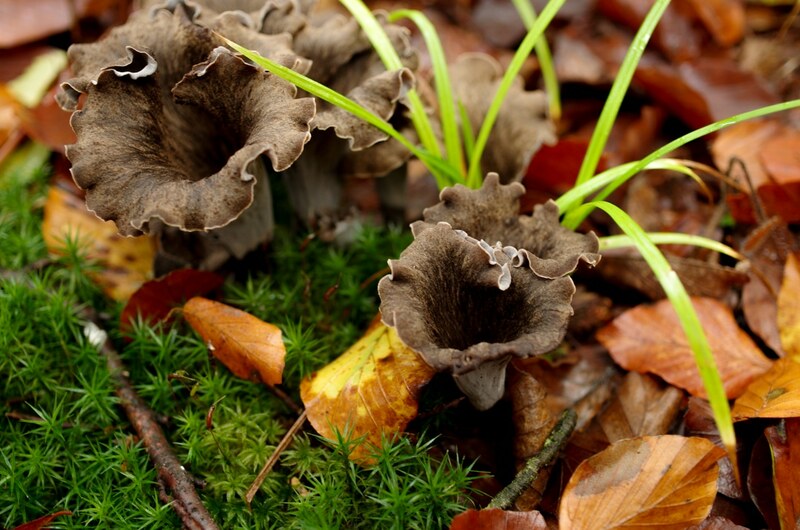 As the mushroom is almost black in color, it is hard to find as it blends in with the foliage on the forest ground. The black trumpets always grow together, so if you find one, look for more around the first one. Its flavor increases once it’s dried and it is similar to black truffle. Once dried they can be ground to powder and used in sauces or soups on cold winter days. 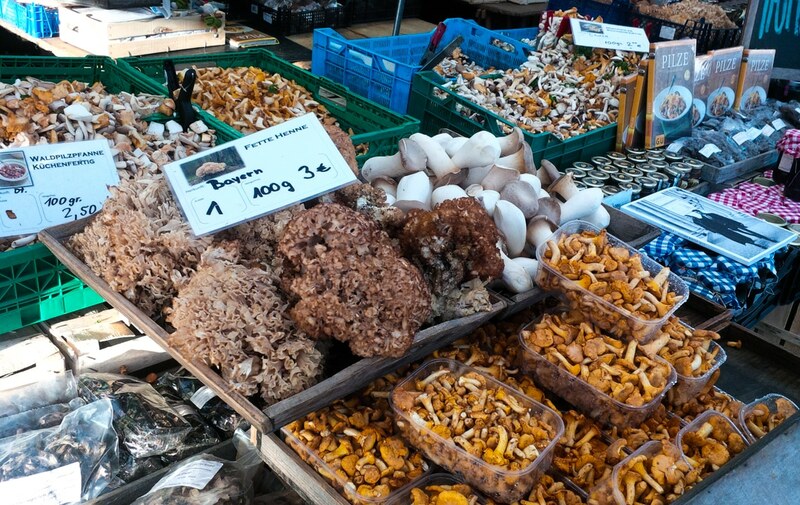 All three types of fungi (the boletus, the horn of plenty and chanterelles) are delicious prepared in various ways: in soups, with rice as a risotto, with pasta or simply on their own in the frying pan with some butter, garlic, salt and a pinch of black pepper. Please do not collect and eat wild mushrooms without enough knowledge of what you are harvesting. If you are a beginner, always consult or join an experienced mushroom expert for collection and perform some double-checking afterwards. Even experienced collectors check after the harvest and in case of doubt, always get rid of the ones they are not sure about. Bring and use a small knife to cut and not pull the mushrooms by the roots, so they can keep growing and giving further harvest. Did you know that the best way of cleaning them is with a small brush (or even an old tooth-brush)? It is also important to avoid rinsing them with water, in order to keep the delicate perfume and flavors. 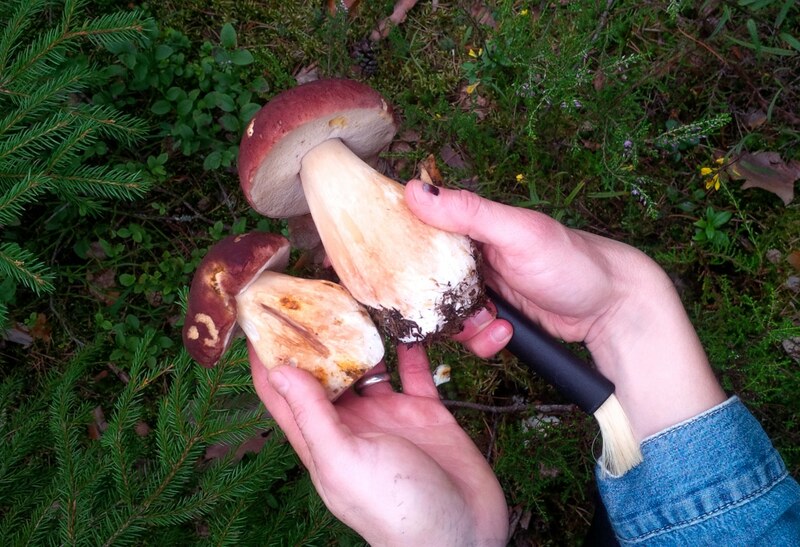 Click here for more tips and hints for mushroom-foraging, what to eat what to avoid. 4 Responses to "The Wild Mushroom Kingdom"
Thanks a lot for this informative link and the comment! Bravo Jana pour ce bel article bien écrit, illustré et informatif. Pour le bolet, tu aurais pu préciser que tu parlais de l’Edulis car il y a des centaines de bolets, dont pas mal de toxiques ou immangeables (Satanas, Calopus, Erythropus…). Pour la cuisson, j’évite l’ail, le persil et autres condiments trop forts qui tuent le goût de base du champignon. Sel et poivre suffisent souvent. Merci Beaucoup Rene! I have added your information and boletus-details as suggested. Much appreciated and happy to received a feedback from such a passionate mushroom-foragers as you.